Hide this Project (Primex Verterra) Discover properties in other projects by hiding the ones that doesn't interest you. You won't see them in your searches further but you can unhide anytime later. Hide this Dealer (Dhivya) Discover properties by other dealers by hiding those whom you have already spoken to. You won't see them in your searches further but you can unhide anytime later. Hide this Dealer (N SIVASHANKARAN) Discover properties by other dealers by hiding those whom you have already spoken to. You won't see them in your searches further but you can unhide anytime later. Hide this Dealer (Murugan) Discover properties by other dealers by hiding those whom you have already spoken to. You won't see them in your searches further but you can unhide anytime later. Primex Verterra, a ready to move housing unit by Primex Infrastructure is located in Porur, Chennai North. The project offers well designed 1BHK, 2BHK and 3BHK apartments which are conceptualized to facilitate the needs of potential home buyers. Porur, a prime residential destination of Chennai is located in the western quadrant of the city. The locality offers well designed affordable housing units and is a viable option for the homebuyers who are looking to invest in the suitably priced residential complexes. Apart from the affordability, the locality offers numerous benefits including swift connectivity, improved physical infrastructure, wide and expansive road structures and proximity to prominent locations of the city. Chennai?s real estate sector is on rise as the city has a good spread of both commercial as well as residential properties. The variety to choose from has aided the property market of the city thereby, making it profitable for the developers to earn healthy returns in the coming years. This progress is on the back of several factors including good connectivity, improved infrastructure, IT boom, and availability of modern day conveniences. Additionally, the significance of these factors has driven the sales of ready to move housing units and has encouraged the developers to launch more well designed and innovative housing units. Therefore, buoyed with positive sentiments, the city is considered to be a gold mine for both the developers and potential homebuyers. In which area is Primex Verterra located?The project is situated in Porur, Chennai West. What size of flats are available in Primex Verterra? The apartment sizes in the project vary from 575.0 sqft to 1244.0 sqft. What is the 2 bedroom size in Primex Verterra? 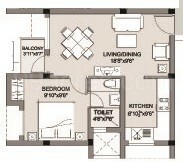 2 BHK units in the project are available in a size of 802.0 sqft to 994.0 sqft. What is the area of 3 bhk in Primex Verterra? Three-room units (3BHK) in the project are available in an area of 1129.0 sqft to 1244.0 sqft. What is the total area of Primex Verterra?The project spans across 4.2 Acres.